Kawaihuelani has historical roots that go back to 1922 when Hawaiian language was first offered at Mānoa and taught by Frederick W. Beckley. 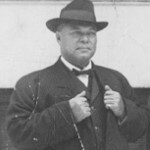 In 1926 John Henry Wise began teaching Hawaiian and continued until 1934. For an article on Wise in Hana Hou! magazine by KCHS instructor Ron Williams, click here. In 1926 Hawaiian became a second language elective, and in 1985, a Bachelor in Arts in Hawaiian was awarded permanent status. Notable instructors include Reverend Edward Kahale, Rubellite Kinney Johnson, and Samuel Elbert.